Decoration Day, which later became Memorial Day, was a refusal to accept a country divided. It was the costliest olive branch of peace America ever had the courage to offer itself. On the first Memorial Day, families from North and South gathered together, shoulder to shoulder, in Arlington National Cemetery to honor those lost in the Civil War. Some 20,000 soldiers’ graves—many of them Union, some Confederate—were strewn with flowers, encircled by both their loved ones and their former enemies. Families from both sides stood next to each other and recognized one another’s pain, despite being enemies for the previous four years… years that are still the bloodiest in America’s history. 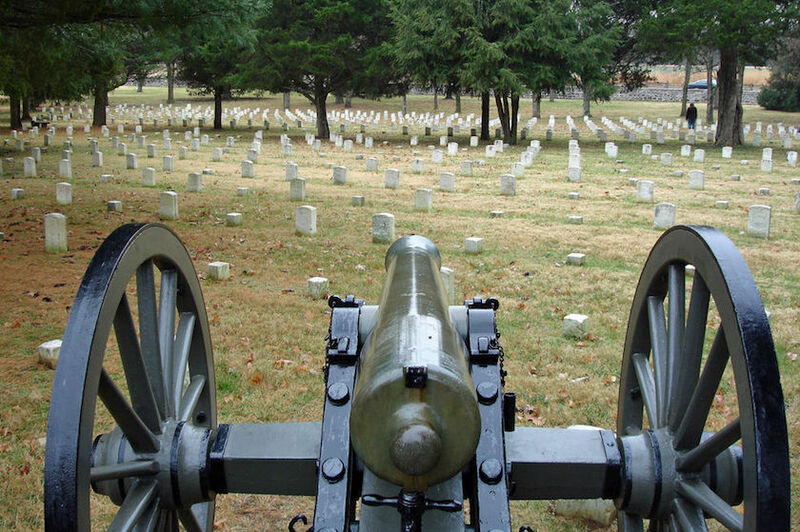 More Americans died in the Civil War than both World Wars, Korea, and Vietnam combined. The North and South may have fought each other for the America they wanted, but we paid the price together. It was out of this pain, this national grief, that Memorial Day grew. The act of decorating not only their own soldiers’ grave, but also an enemy soldier’s tombstone, was a declaration of shared humanity. An acknowledgment that their enemies’ lives mattered as much as their own. Honoring the enemy dead was a physical act that rejected bitterness and gave hope to the living. They laid down their weapons of fear, hate, and resentment, and refused to be enemies any longer. They knew healing our nation would require someone to cross the divide and choose a new story. In that moment, standing together in the midst of deep pain, loss, and rage, those families saw each other and belonged to each other. They chose life, surrounded by 20,000 gravestones. Stones River National Cemetery. Photo by Hal Jespersen. It’s the kind of story we like to tell ourselves. But this is a sanitized version of events. The real history of Memorial Day is, well… more complicated. According to some accounts, families of the relatively few Confederate soldiers buried at Arlington were barred from taking part in the first commemoration in 1868. The following year, Union soldiers reportedly stood guard over Confederate graves… to keep them from being decorated. Meanwhile, many Southern states refused to recognize Memorial Day, instead honoring their dead on entirely separate days—all the way until World War I—and in so doing, sanitizing history in their own way. To this day, at least six states still commemorate Confederate Memorial Day. Confederate Memorial Day service in 1922. National Photo Company Collection at the Library of Congress. Those present on that first Memorial Day struggled to envision a thriving, united society. Like us, they probably found it hard to see a way forward, into the more beautiful world that our hearts—and theirs—ache for. Peacemaking doesn’t always go as planned, because it requires both sides to participate. Even when an olive branch is rejected, real peacemakers don’t withdraw the offer. It remains on the table until both sides have healed enough to accept it. The history of Memorial Day—both the good and the not-so-good—can teach us that part of peacemaking is creating safe spaces where people can heal. Even before peace has been made. And if others aren’t ready to make peace with us, at the very least, we can refuse to be their enemy. In doing so, we can write a new narrative. Create a new identity. Shape a new future. So, if you tell your children one thing about Memorial Day, tell them what it should be about: healing our country. Belonging to each other and crossing enemy lines to make peace instead of war. Tell them that peace is possible if we choose to see a different story, if we choose to see each other. All we need is to do is walk across the pew, the aisle, the trench, and make room for healing—both ours and theirs. That simple, courageous move invites us all to redefine who we are together and declares that we need not be enemies any longer. Where does that leave us today in an America that feels divided? We can stay on our side and uphold the divide, simply by doing nothing, or, we can cross that enemy line, acknowledge the other person’s loss, and build a future together. Because violence and polarization cannot stand when we look each other in the eye and say, “I see your pain.” There is always a way forward toward peace if we choose to see each other. This Memorial Day, we have the opportunity to be an olive branch in our broken communities. But someone has to make the first move. This year, will it be you? Will you be the one to start mending the country our soldiers died for? Start by moving toward someone you would normally move away from and make room for their pain or fear—just by listening. This could be as simple as going out for coffee with someone you disagree with politically—just to hear their concerns, not to argue. It could be attending an interfaith event, to learn about and listen to the experiences of religious minorities—to acknowledge the painful experiences of our Jewish, Muslim, Hindu, Sikh, and indigenous brothers and sisters in modern America. You could attend a local Black Lives Matter chapter—even if you have questions or misgivings—to hear about a person of color’s lived reality in our country. Or you could invite someone to dinner who is very different from you, or go out of your way to support immigrant-owned businesses in your town and get to know the owners. Our country needs people who are unafraid to stand alongside someone they don’t agree with or fully understand—or maybe just haven’t taken the time to get to know—in order to build the more beautiful country we know is possible. This Memorial Day, let’s not just remember the cost that soldiers paid this Memorial Day. Let’s join in their sacrifice by rebuilding the America they gave their lives for.